All of these characters are variable, and several must often be considered before identification can be made. It is in the seeds of the two species that an almost infallible means of separation is found. A-ha. I need to collect seeds, once they’re ready. Of course, that would be illegal. I might be making some inquiries soon. Maybe I can get permission. You know, for science. Enough of this. Enjoy the pictures. Sometimes the difference between two closely related species is pretty obvious, as in white trout lily and American trout lily (one is white, the other yellow). Sometimes the difference is pretty minor, as in the presence of auricles in American trout lily and dimpled trout lily. 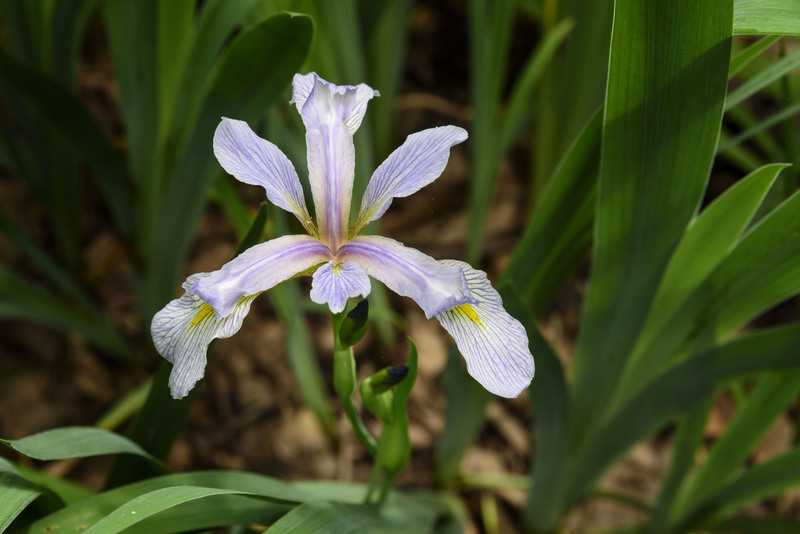 When it comes to Iris versicolor and Iris virginica, there are numerous differences. After hours spent reading the literature, I was able to tease them out. They’re detailed in the chart below. I. versicolor is mostly a northern species, while I. virginica is mostly southern (with a few disjunct populations along the Great Lakes). Maryland is one of the places where their ranges overlap. If I’d seen them in Massachusetts or North Carolina, I could identify them by location alone. But I found them in Maryland, in Montgomery County, where both species have been reported, which brings up another problem, but that will have to wait. Many of the differences as described are relative rather than absolute. Also, some authorities differ, as you’ll see. Sources (and a few definitions) are at the bottom. I sampled six plants at each of the two sites. Stand #1 is situated in a vernal pond, currently without standing water, with a tree canopy providing plenty of shade. Although there are a lot of irises in the stand, only six were blooming; these were all in the relatively sunnier part of the stand. 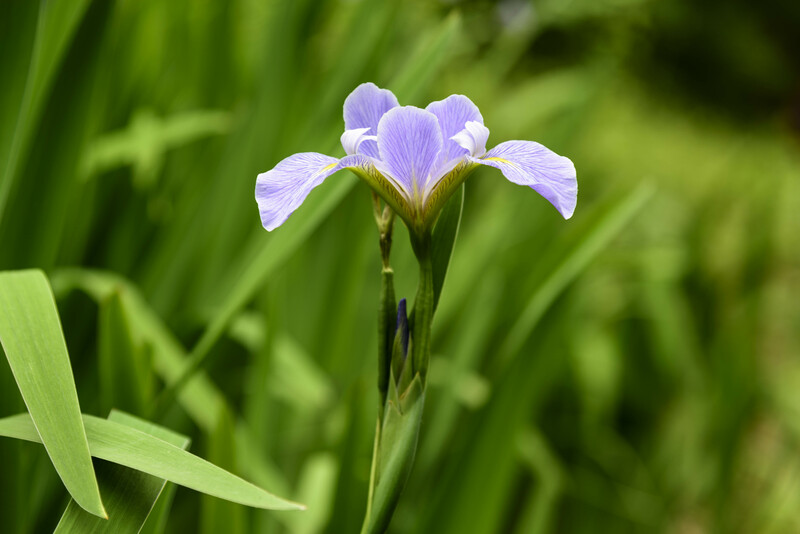 The irises form a near monoculture, surrounded by a near monoculture of lizard’s tail (Saururus cernuus). Stand #2 is situated along the C&O Canal, next to but not currently in the water. The site is almost fully sunny, with some dappled shade provided part of the day by a single large tree. The area is swarming with other plants, both native and alien. Most of them are kept small and short by occasional mowing of the bank above the irises. In Stand #2, two plants had cauline leaves longer than the flowering stem, one had leaves equal to the stem, and three were shorter. One plant had all three petals notched while two plants had no petals notched. The other three plants each had one notched petal, with the other two missing or damaged. The spathes looked much the same as in Stand #1. I was unable to see far enough into the style arms to determine if there were auricles. 15 “Signal” a bright yellow, pubescent patch. 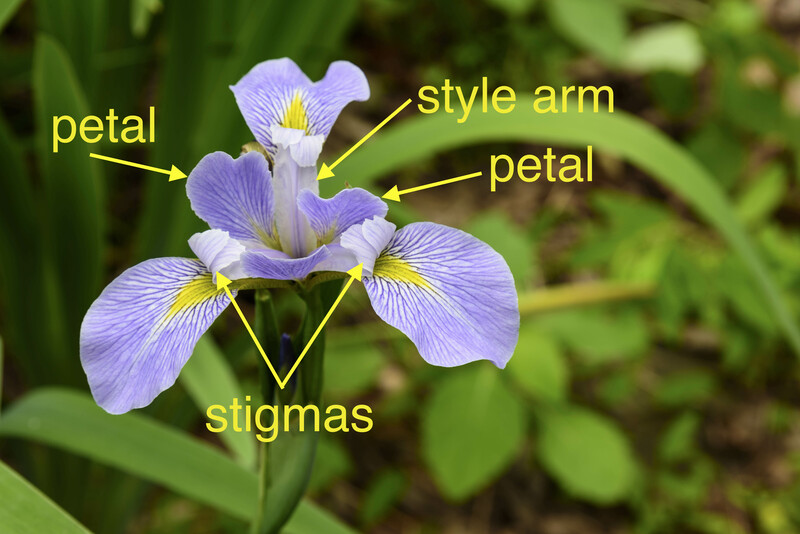 Based on my observations, I have to conclude that Stand #1 is Iris virginica. Stand #2 is trickier because there was variation, but since the signals were pubescent, I have to say that those plants are also I. virginica. Also, I should be so lucky as to find significant stands of two similar but different species within a hundred yards or so of each other. But… which variety are they? In Stand #1, four of the plants had two branches, one had one, and one had three. Three of the plants also had axillary inflorescences (secondary flowering stems arising from a leaf axil). The plants were of fairly uniform height, around 80 to 90 centimeters. So these are probably I. virginica var. shrevei. Stand #2 was again a little trickier. The plants I measured were 70 to 80 centimeters tall, but I can’t tell the height for the whole stand, as they were growing up a bank and I really didn’t want to stick my hands down in there among the poison ivy to measure them. Five of the plants had two branches, and one had one branch. Only one had an axillary inflorescence. Again, should I be so lucky as to find two different varieties so close together? I doubt it. I’m going to make an educated guess that Stand #2 is more stressed by the presence of many different species of plants and a less uniform soil (along the edge of a canal, randomly rocky, versus uniformly wet, level soil with essentially zero competition from other forbs), and that these factors account for the variations. These plants are very likely the same species as Stand #1. 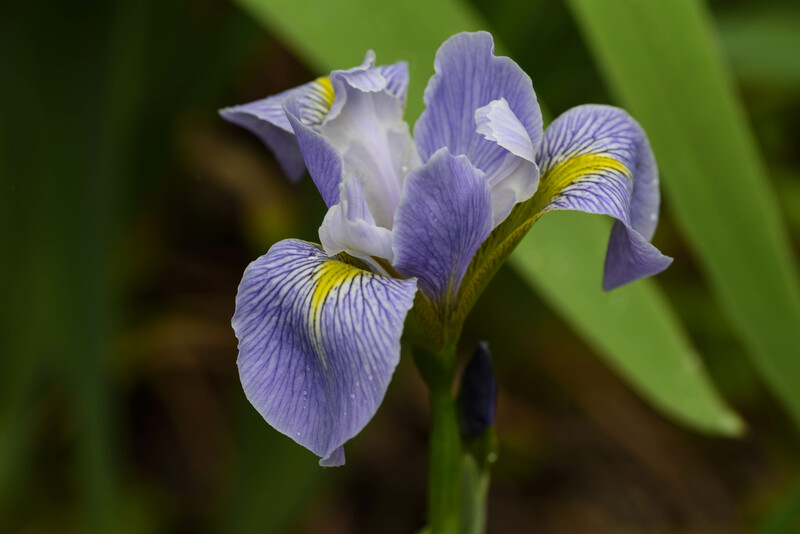 Irises are beautifully complicated flowers. 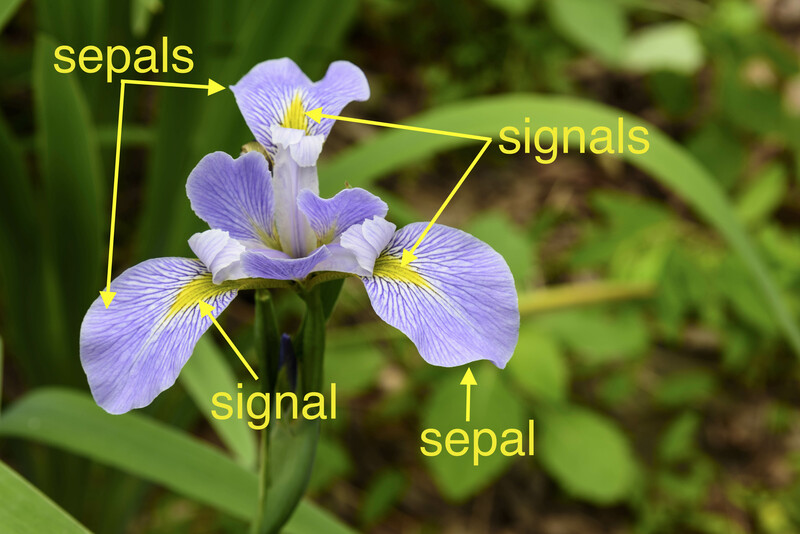 In order to identify the species I’d found, I needed to understand how irises are described, and how they’re structured. 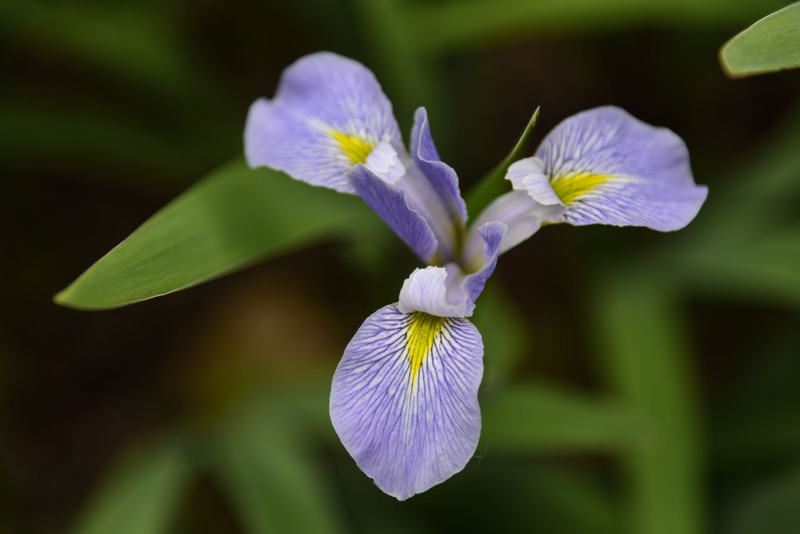 Irises are monocots. Monocots usually have different growth forms and habits from dicots. 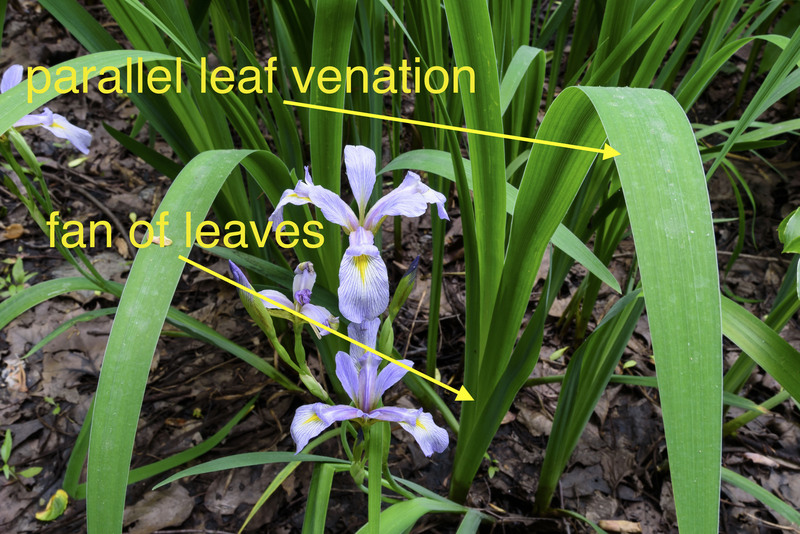 This group of leaves arising fan-like from a single point is a typical (though not universal) characteristic of monocot plants. Looking closely you’ll see parallel veins, also typical of monocots, although there are dicots with parallel venation. Dicot flowers mostly (but not always) have parts in fours or fives, or multiples of. Monocot flowers are mostly in parts of threes, or multiples of. 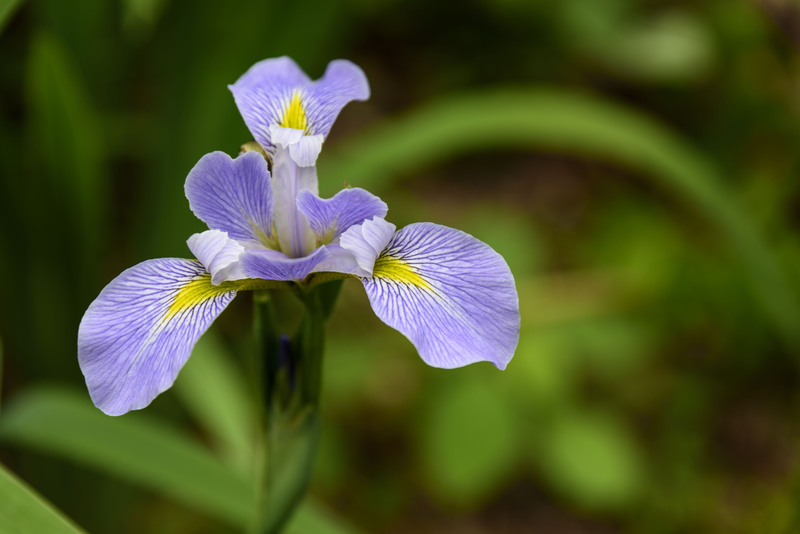 Irises have three sepals and three petals. The sepals lie more or less horizontally, and have brightly colored central sections called signals. The abruptly narrowed part toward the inside is sometimes called the claw. The stamen is above it, hidden by the style arm. 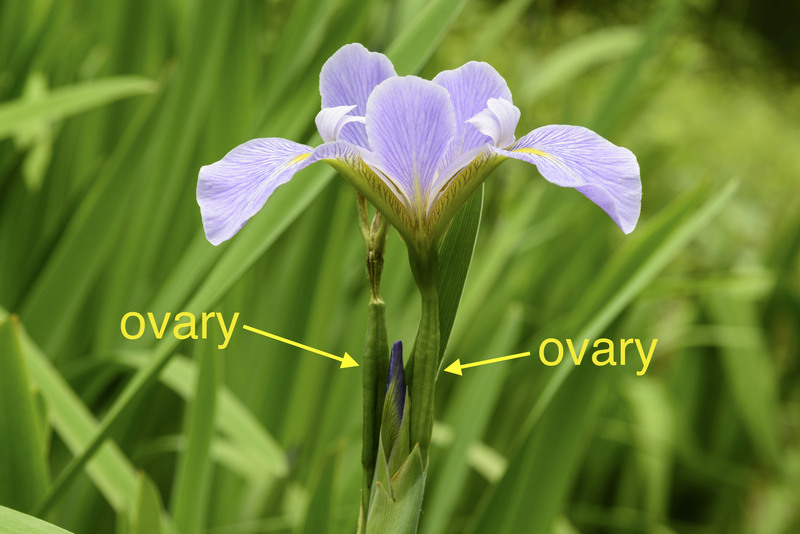 A flower’s gynoecium (“female” part) is called the pistil; it consists of a stigma, which receives pollen, and a style, which connects the stigma to the ovary. 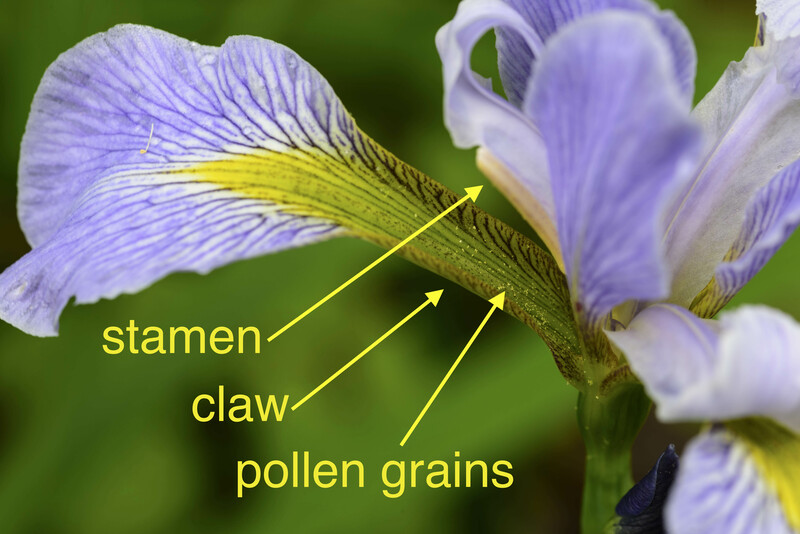 In irises, the style is often called the style arm or style column. It’s the petal-like structure lying atop the sepals, covering the claws. The two curled lips on the ends of the style arms are the stigmas. The petals are more or less vertical. The ovary is below the rest of the flower (this is termed inferior), and looks like a swollen part of the peduncle. 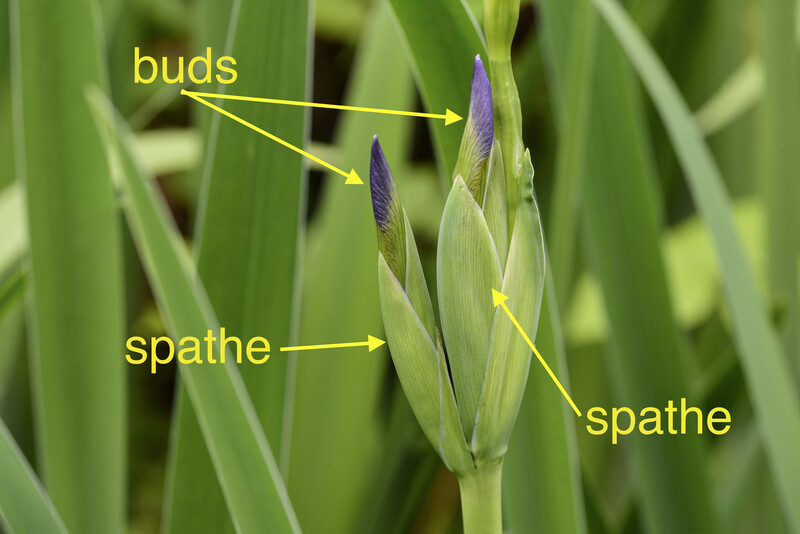 Surrounding the emerging buds is the leaf-like spathe. Horticulturalists refer to the sepals as falls and the petals as standards, but I’ve never seen these terms used in botanical sources. I hope to post more pictures in a few days, when the iris series is done, but if I wait ’til then these plants will be done blooming, so go looking for them now. Baptisia australis (Fabaceae) is not often see in Maryland. It likes the bedrock terraces in the Potomac Gorge. Be careful of high, fast-moving water and poison ivy. There isn’t much else blooming now, so the color really stands out. Three years ago, when I started this blog, I was making simple posts that combined my interest in plants with my newfound hobby of photography. My focus changed as these two interests grew and reinforced one another: the more I learned about the plants, the more I wanted better pictures of them. And as I got better pictures, I wanted to learn even more about the plants. So this blog is mostly an exercise in teaching myself photography and botany. 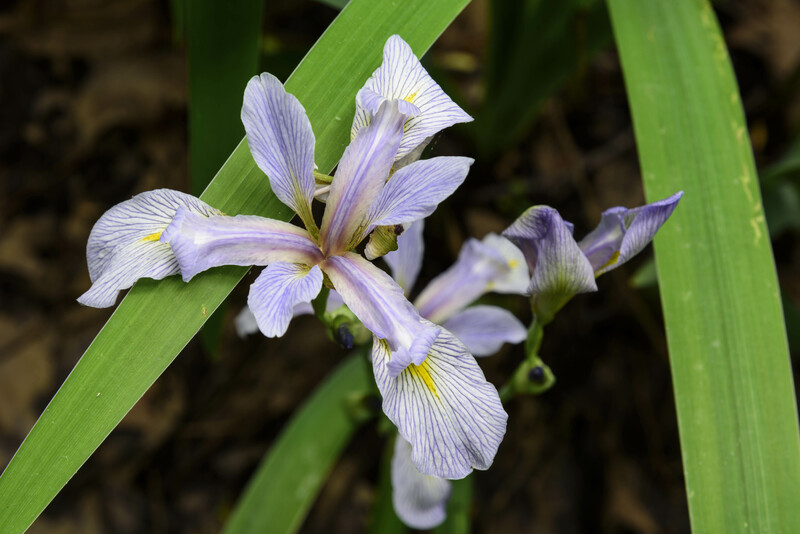 Which leads me to irises, because while attempting to identify the beautiful flowers pictured here, I crossed a line: I’m not just interested in native wildflowers, I’m obsessed with them. This iris is a perfect example. Last Sunday I went out to visit two stands of these plants, with the single goal of getting better pictures than I’d gotten in past years. 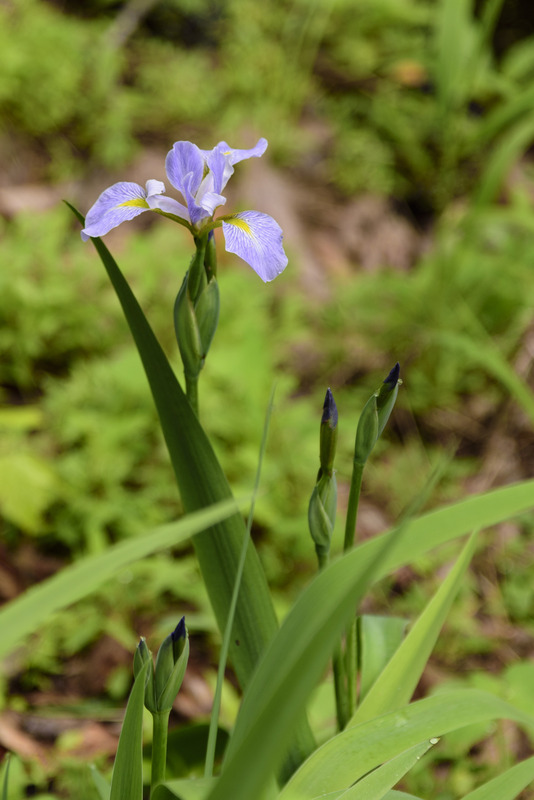 But then I decided to reconsider my earlier identification of them as Iris versicolor (harlequin blue flag, or northern blue flag). 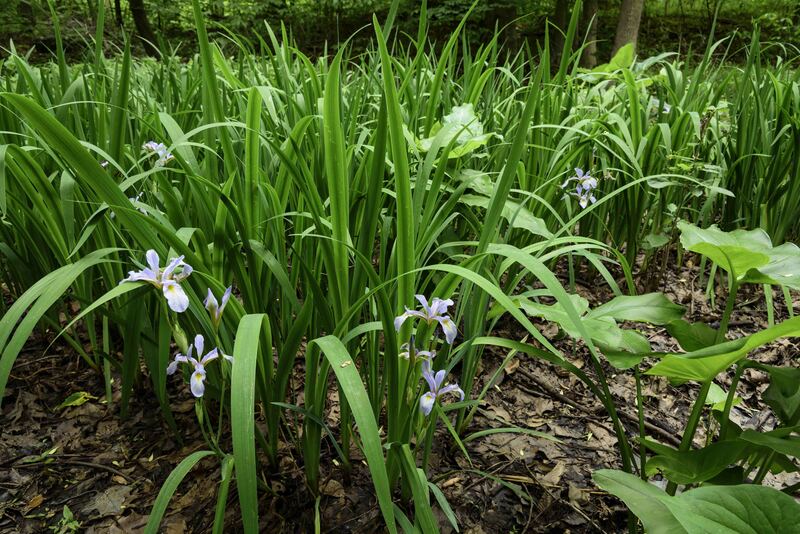 Could they be Iris virginica (Virginia iris or southern blue flag)? The pictures didn’t provide enough information, or the right information, so Monday morning, as soon as the rain passed, I donned rain jacket, rain pants, and gaiters, got a notebook, pen, hand lens, and measuring tape, and went back to the site. The rain gear was really for protection against poison ivy (it didn’t entirely work), as I’d have to scramble along a bank covered in it to get at one of the stands. Then I went home and compared my notes to every description of the two species I could fine on-line. I came to a tentative conclusion, but wasn’t convinced. One of the problems was that even under 10x magnification with a hand lens, I wasn’t quite sure what I was seeing. So Tuesday morning, with rain in the forecast, I went out again, with full kit including camera, tripod, and macro lens, and spent more time taking pictures and more time making notes. And then spent more time on-line trying to figure it all out. To understand technical descriptions you need to know the language, and to identify species you need to understand flower structure. 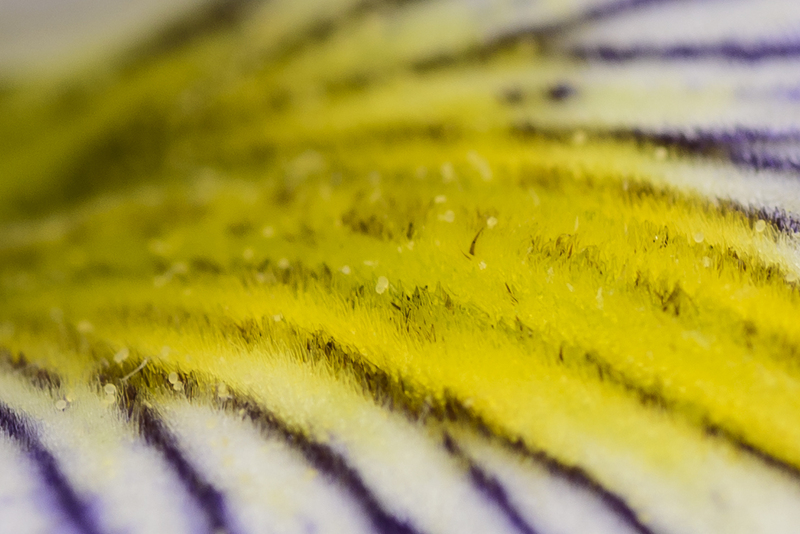 And irises have a language and structure all their own, so that’s going to be the subject of tomorrow’s post. 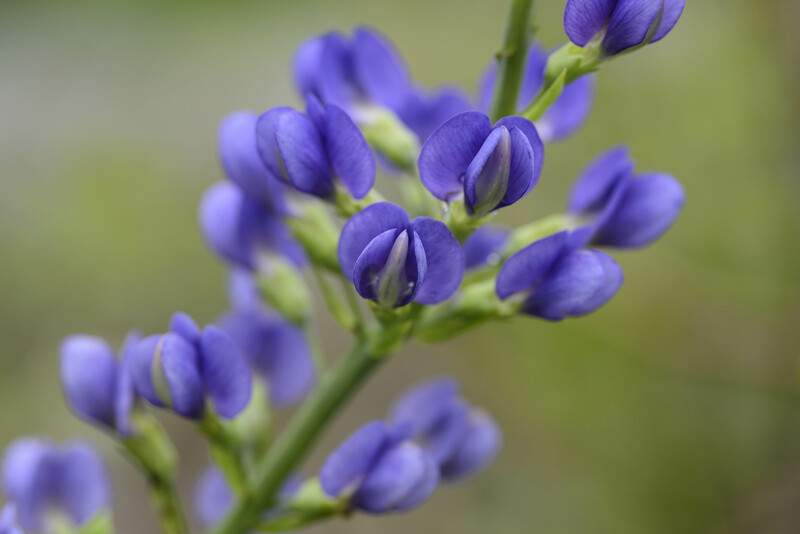 If you ever want basic facts about our native wildflowers – like when they bloom – don’t forget to check the species pages here on this blog. Scroll to the top of this page and click on either Plant List (binomial) or Plant List (common names). From those lists you can click on links that will take you to species pages. A note on bloom times: “early” means the first of the month to the 10th; “mid” means the 11th to the 20th; “late” means the 21st to the end. Bloom times vary, especially for plants that bloom early in the year, so if you want to see a species blooming, start looking for it at the earliest reported time, or even before. Be cautious: “observed blooming” means exactly that. No more, no less. If I only saw it blooming in early May one year, that doesn’t mean it wasn’t blooming in mid May or late April. It could mean that I wasn’t around at other times to see if it was blooming or not. For most of these species, the recorded bloom times were for plants found in the Potomac gorge. 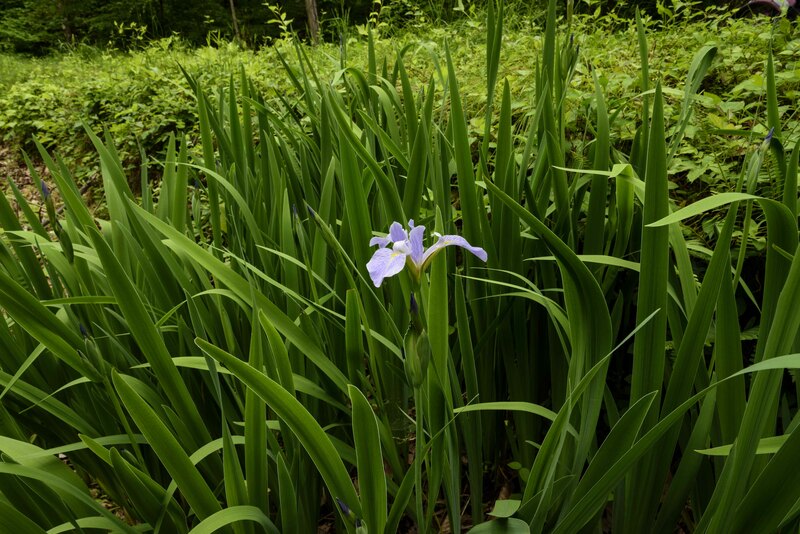 Plants may be blooming sooner to the south or in the coastal plain, or later to the north in the Piedmont and in the Blue Ridge. The pages are within a few days of being up-to-date for 2017.
pictured: one of our native irises, soon to be the subject of an extensive analysis; stay tuned! Thursday, May 18: one more trip to Rachel Carson Conservation Park to find and photograph the elusive large twayblade. Thanks to detailed directions from a friend, I found a nice group of the plants, about half of which were in bloom. 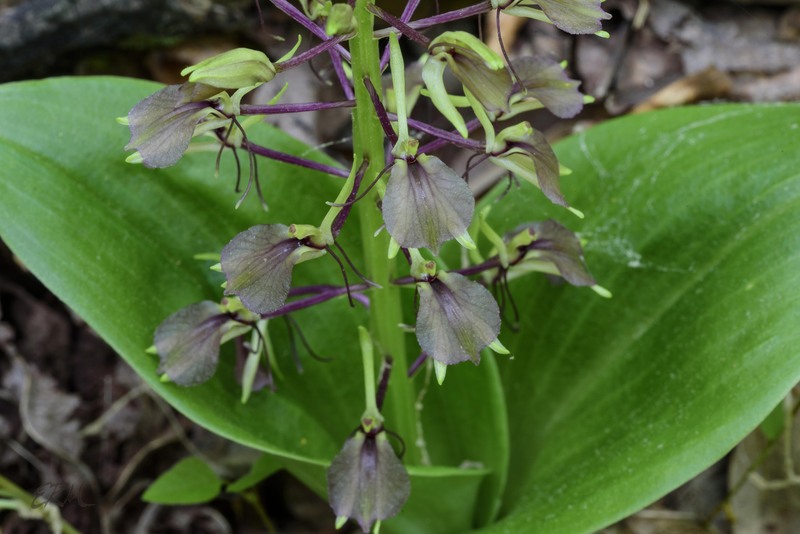 Also know as purple twayblade, brown wide-lip orchid, and mauve sleekwort, Liparis liliifolia is one of our native orchids. 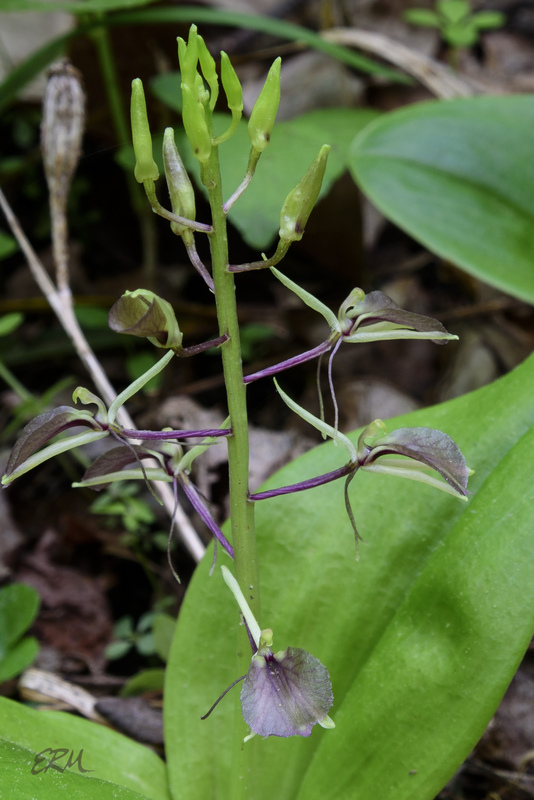 The two large basal leaves stand a few inches tall, while the flowering stem (a raceme) stands up to about a foot tall and produces as many as thirty flowers. The lowest flowers open first. 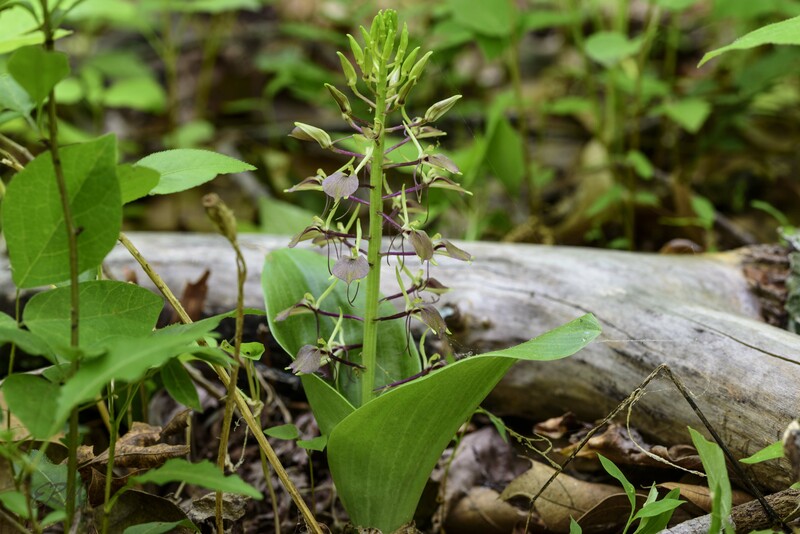 A colony of large twayblade will bloom for about two to three weeks. All orchid flowers have three sepals and three petals, although in some species these parts are so highly modified they may not be recognizable as such. 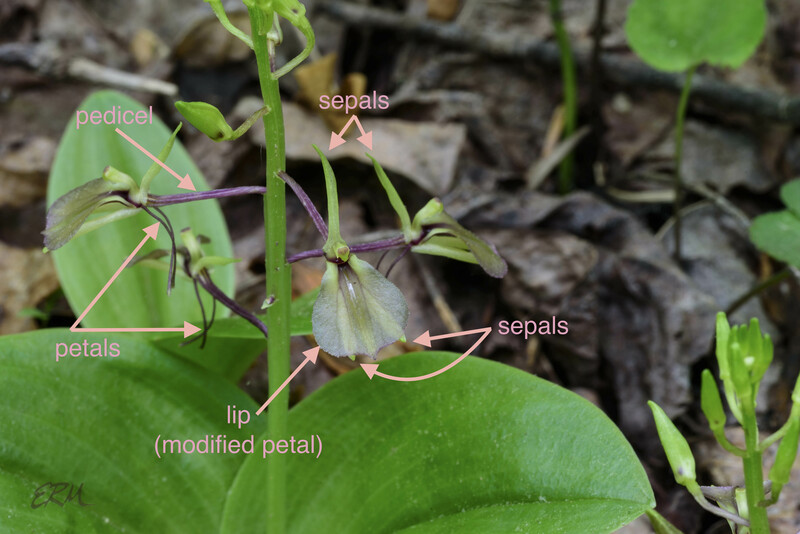 In large twayblade, the lowest petal is modified into a wide labellum (lip); the two lateral petals are very narrow and droop down inconspicuously. 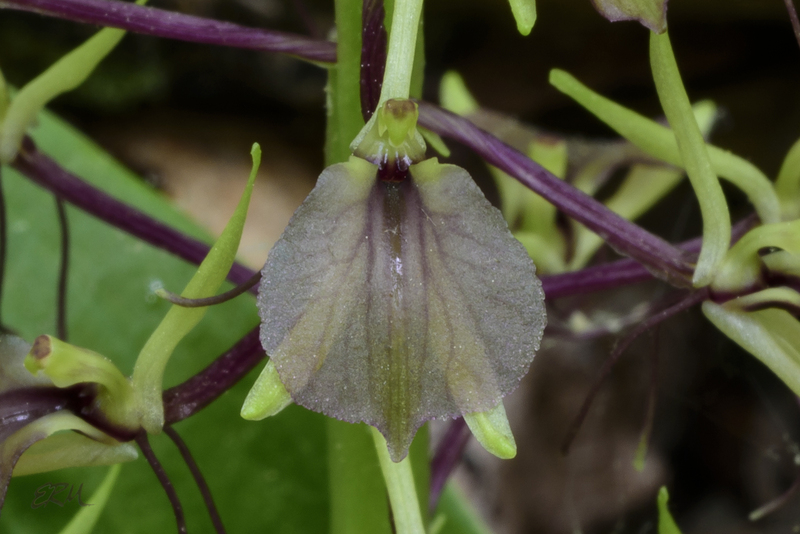 You can see the two lower sepals through the labellum, which is so thin it’s actually translucent. Large twayblade can be found in the Mid-West, Mid-Atlantic, New England, and northernmost parts of the South. It’s threatened in Massachusetts and Vermont, and endangered in Connecticut, New York, and Rhode Island. In Maryland it’s listed as S2S3/state rare. Look for it in rich, moist woodlands. It should still be blooming in the Maryland piedmont. 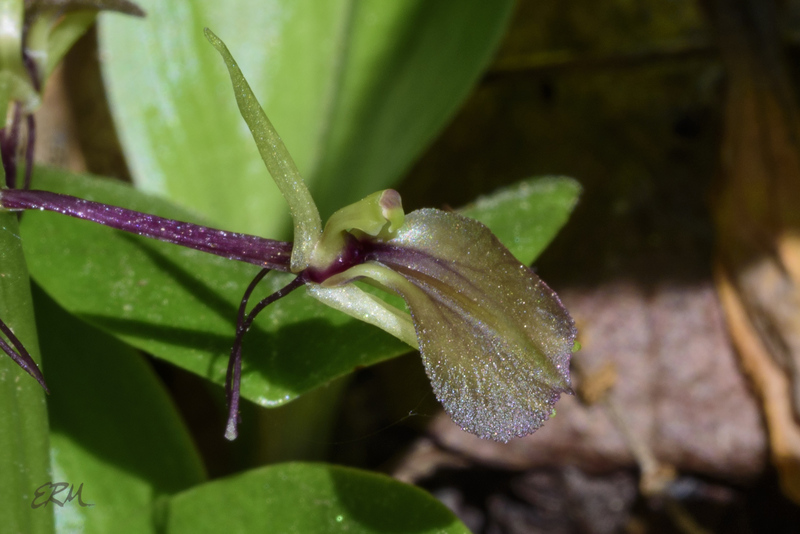 The purple/brown colors of the petals and pedicels make for good camouflage against the leaf litter, but the distinctive pair of basal leaves stands out. “Tway” is an obsolete word meaning “two”.